French President Emmanuel Macron, left, and Chinese President Xi Jinping shake hands after a joint press briefing at the Great Hall of the People in Beijing, Tuesday, Jan. 9, 2018. During his first state visit to China this week, French President Emmanuel Macron brought with him two key messages, analysts said. One message was about the huge possibilities cooperation between China and Europe could bring and his commitment to that effort. The other, a warning to not underestimate growing concern and frustration in Europe – and elsewhere – with what many regard as China’s unfair trade practices such as investment restrictions in many sectors that are not blocked in countries overseas. Matheiu Duchatel, deputy director of the Asia and China Program at the European Council of Foreign Relations said President Macron’s visit goes beyond France. “He wants to present himself as a leader of the EU, but at the same time, I think he wants to send a signal that Europe and the EU are in better shape than many think in China,” Duchatel said. Despite the Brexit referendum, Catalonia’s push for independence and the broader rise of populist parties, Duchatel said that now – more than before – governments in Europe are voicing concern about China’s trade practices. French President Emmanuel Macron delivers a speech at the Daming Palace in Xi'an in northwestern China's Shaanxi province, Monday, Jan. 8, 2018. “Many are coming to terms with the reality that China is no longer the factory of the world, but it is clearly a country that has very strong ambitions in terms of economic leadership for the world and it is not a market economy,” Duchatel said. In China, President Macron went to great lengths to highlight his desire to meld both the interests of Europe and China, presenting China’s leader Xi Jinping with a gift of a horse, an eight-year old gelding named Vesuvius. During his first stop in Xi’an, Macron talked up China’s massive trillion-dollar trade and commerce project, the “Belt and Road” initiative, offering Paris’s support, albeit with a caveat. Xi’an was once the starting point of the Silk Road, ancient trade routes for silk, spices and horses that China seeks to build on adding maritime routes as well. In a speech at Daming Palace, the former royal residence during China’s Tang Dynasty, Macron noted that the ancient Silk Roads were never only Chinese. 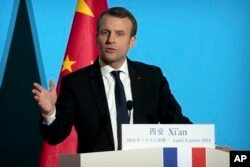 In a speech at a start-up incubator Tuesday, with Alibaba Founder Jack Ma at his side, along with other French and Chinese companies, Macron also talked about the possibilities cooperation could bring and warned about the looming threat of protectionism if adjustments were not made. "France imports 45 billion from China but only exports 15 billion, so we have access to markets which is unbalanced, unsatisfying. If we don't deal with this responsibly, the first, natural, reaction, the one we've had for too long, will be to close up on both sides," Macron said. French President Emmanuel Macron speaks at a press conference at the French Embassy in Beijing, Wednesday, Jan. 10, 2018. Jean-Pierre Cabestan, a political science professor at Hong Kong Baptist University said that in many ways the trip is an effort to not only correct France’s deficit problems, but put relations between China and Europe on more equal footing. “I think the message is clear, France and the European Union want more reciprocity a more balanced relationship, and also want to take advantage of the Silk Road initiative, but there are a lot of questions which are not going to be resolved by this trip,” Cabestan said. Like France, economies across the globe want to do more business in the country’s massive market and have more investment come to their shores, but China’s pace of adopting reforms to further open up its doors is feeding a global backlash. 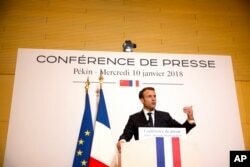 The United States and European Union are currently looking at ways to tighten scrutiny of foreign investments and Macron is an advocate of a tighter screening mechanism in Europe for some sectors. A position he did not hide during the visit. But for now, it’s unclear if anything will change soon. Some analysts argue that given Chinese President Xi Jinping’s frequent stated opposition to protectionism and support for globalization, he has no choice but to press ahead with reforms and soon. Others, however, are not as convinced, noting Xi’s strong support for state-owned enterprises over the past two years. Zhang Lun, a political scientist at the Universite de Cergy-Pointoise said that there is still a big push back against western companies gaining a bigger share of China’s market. “Overall it will be very tough for France to achieve its objective (balancing the deficit), much like (U.S. President) Donald Trump has struggled to balance trade as well. But at the same time, China needs the international market to cope with the growing pressure (to open up more) and its slowing economy,” Zhang said. If China continues to ignore such calls, however, the relationship is likely to only continue to deteriorate.